Lawn Core Aeration is a simple process of removing small cores of soil and grass to allow air, water and nutrients into the root zone. Another way of aerating a lawn is to use a spike aerator that punches spikes into the lawn to make small holes. However, this method isn’t considered as effective as core aerating. How do you determine if your lawn needs aeration? Most lawns can benefit from lawn aeration. However, the biggest reasons to aerate are heavily used lawns, thatch layers greater than 1/2 inch and soils that are mostly clay. An easy way to test your soil is to peal back a section and check the depth of roots. If the roots are only a couple inches deep then your lawn could probably benefit from core aeration. For cool season grasses like we have here in New Hampshire the best time to aerate is in late August or early September when the grass is coming out of the summer dormancy. The grass begins to grow at a rapid rate again and there is little competition from weeds. Lawns should be aerated when the soil is slightly moist, either a day after rainfall or irrigation. How do you aerate a lawn? The best way to core aerate a lawn is to rent a mechanical core aerator from a local rental shop. If you have a large lawn like mine you may want to consider buying a core aerator like the one I just purchased. You can buy the John Deere Tow Behind Plug Aerator over at Rungreen.com. They are a very professional online retailer that specializes in John Deere equipment. I’ll definitely purchase additional John Deere products from them based on my customer service experiences so far. Regardless of the type you use, regular lawn aeration will help keep your lawn looking it’s best. Check out my Lawn Aerating Tips post which talks about the most effective way to aerate lawns including a discussion about plug aerators vs spike aerators. Not all aerators are created equal! Also, if you’re looking to purchase a plug aerator you can buy the John Deere model I own, John Deere Tow Behind Plug Aerator over at Rungreen.com. There are cheaper models available from other manufactures at Amazon, Agri-Fab 40-Inch Plug Aerator or Precision Products 42-Inch Plug Aerator. If all of this seems like too much work you can always hire a lawn service to do it for you. I’ve been aerating my lawn every spring and fall with a hand spiky thing for the past two seasons… it does seem to have made a noticable difference in the lawn! Thanks for the article – very helpful! I just moved into a brand new house with a remnant of lawn and cleared sandy soil that I want to turn into a beautiful lawn. 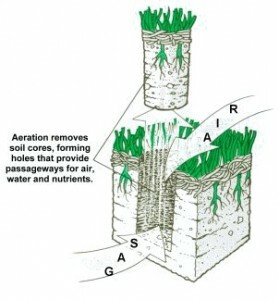 I just heard about aeration – what a great idea! No wonder my old lawn on clay soil never thrived – guess I won’t make that mistake on this lawn! I live in a condo that is about 13 years old and the lawn is a combination of sod and seeded areas. There are small hills and flat areas with very little activity on the grass. Yards have been well taken care of by the landscaping company. There are large areas of very nice grass (when looking at it from a distance), but with closer inspection there are small and large patches that have no grass. When it rains the ground is soft, when it is dry the ground is very hard. I can not find anything that explains the benefit of continuing what we are doing vs aeration, which I have heard is the best thing to keep a lawn healthy. I have thought that aeration is best for all lawns but it is difficult to convince the board that it is worth the expense. Any help would be appreciated. Mike – Sounds to me as though you probably have some type of clay in the sub-grade (soft when it rains, hard when it’s dry). Core aeration can benefit all lawns and is one of the major techniques used by athletic fields and golf courses to keep grass growing well. In my opinion if you’re looking to save money then skip one cycle of fertilizer and aerate the lawn. It will definitely pay off.